Bet you’ve never heard of this one! Baccalà is salted or dried cod – a food that became popular in the region of Venice when Piero Querini, a travelling merchant, shipwrecked in Norway and developed a love for this high protein, easily stored food. He brought it back to share, and it has been imported in great quantities ever since. Served with soft polenta (a savoury cornmeal porridge popular in Northern Italy), it becomes a unique dish worth seeking out. Best eaten after a long day getting lost in the backstreets of Venice or Verona. 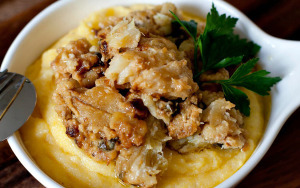 Though Baccalà officially means “salt cod” it is often dried cod which is served with this classic Veneto dish. The truffle is one of the most prized foods in the world, and it is no surprise that it grows in Tuscany, one of the most popular foodie regions of Italy. Truffles are mushrooms that grow underground – they are not cultivated, but must be found using specially trained pigs or dogs. This difficulty in obtaining them, combined with their very strong flavor, make them an expensive commodity – some fetch up to $4000 per kilo! 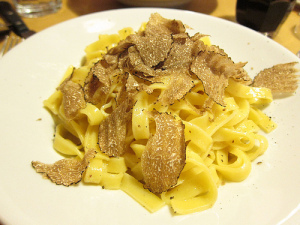 Truffles are often used to flavor butter or oil, and can also be found thinly (VERY thinly) sliced on Tagliatelleal Tartufo – egg noodles with truffle. And the price won’t break your travel budget! If it (or anything with truffle) is on the menu – try it! Best eaten after a day of being overwhelmed by the art and architecture of Florence. Even sliced razor thin, truffles still pack a deluge of flavour. I can hear you now, “Knödel? Isn’t this supposed to be a list of Italian food? That looks German to me.” The beautiful Trentino-Alto Adige region, more commonly known as the South Tyrol by local residents, is the northern-most region of Italy, bordering Austria, and it’s culture, cuisine, and language reflect a Germanic heritage. Knödel simply means dumpling. And the varieties found in this region are creative, mouthwatering masterpieces of culinary art. Try a mixed plate – one made with spinach, another with beets, another with speck (a local ham). So good! Best eaten after a day hiking in the glorious Dolomites. 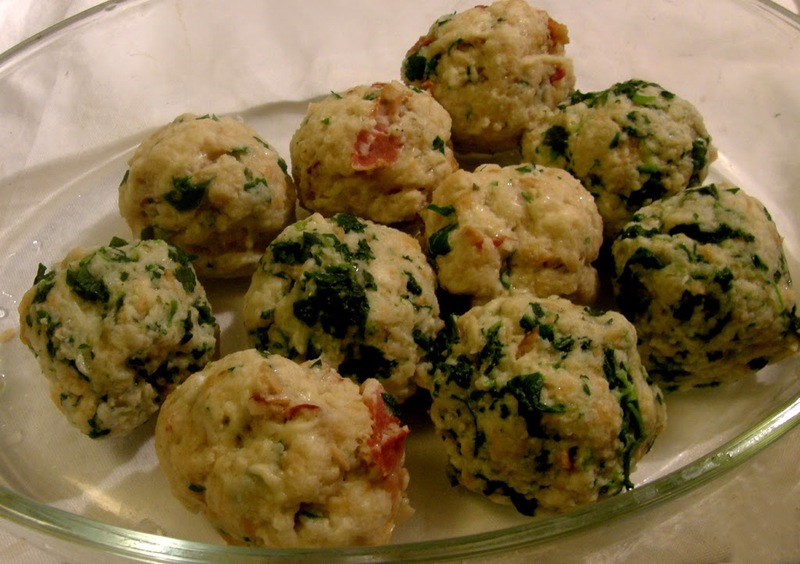 Served with a broth or without, Knödel will satisfy even the heartiest of appetites. Pizza is good pretty much anywhere in Italy. But when you are in Rome in the Lazio region, you must try the Pizza Napoli. 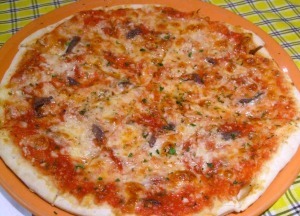 Pizza originates in Naples, south of Rome, but has spread all over the country (all over the world!). Pizza Napoli celebrates the origins of this fisherman’s lunch – thin wheat crust, fresh tomato sauce, mozzarella cheese and anchovies. Simple, but bursting with flavor due to the fresh sauce and the anchovies. Don’t like anchovies? Try the pizza Margherita – same thing but no fish. Best eaten after spending the day rummaging through the ancient past at the Roman Forum. Your Pizza Napoli won’t be “swimming” with anchovies – just a few are enough! Liguria is a small region on the north coast of Italy that is often referred to as the Italian Riviera. It is also the birthplace of pesto – a heavenly mixture of basil, coarse sea salt, pine nuts, garlic, extra virgin olive oil and grated Pecorino Romano cheese. 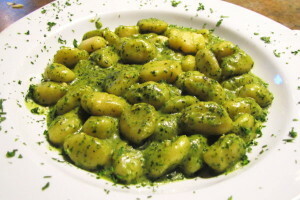 The name pesto is derived from the Italian word pestare, “to crush” – the above ingredients are tossed into a mortar and crushed together with a pestle. 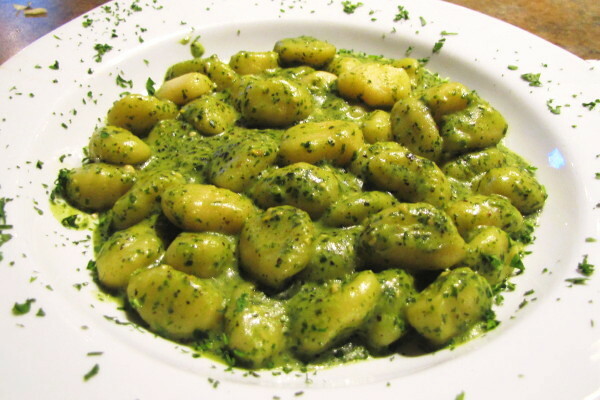 A platter of warm, soft gnocchi (small potato-wheat dumplings) smothered with fresh pesto (fresh as in the basil was picked that morning) is an eating experience you will never forget. Best eaten after a hike anywhere in the Cinque Terre! It’s not easy being green. But it is so tasty! Interested in trying some of these dishes for yourself? Why not join the Grand Tour of Europe, which includes great regional food like this during our eight days in Italy! Or if you’re looking for more Italy than that – try our Italian Experience tour! Something on this list that I’m missing? Let me know!